Appearance: Light gold. On the glass it is clingy and insistent like an insecure lover. On the Palate: Full-bodied, more butter, big peat, white chocolate, but lots of sweet malt too. Finish: The finish is a monster. Big, hot and aggressive, with the long hidden smoke making its appearance. As the sweetness fade from the palate the smoke and peat and alcohol erupt from the back of the mouth, swirl around the mouth and engulf the tongue, cheeks and lips in a symphony of fire. Parting words: This was my first bottle of Ardbeg and I have enjoyed it quite a bit. I remain a Scotch novice, but compared to the other Islay malts I’ve tasted so far, I think I would rank this whiskey in the middle of the pack. Not to say this is a mediocre whisky by any stretch, it’s excellent. But at the same price I think I would prefer something from Laphroaig if I had to choose. Luckily, I don’t have to. 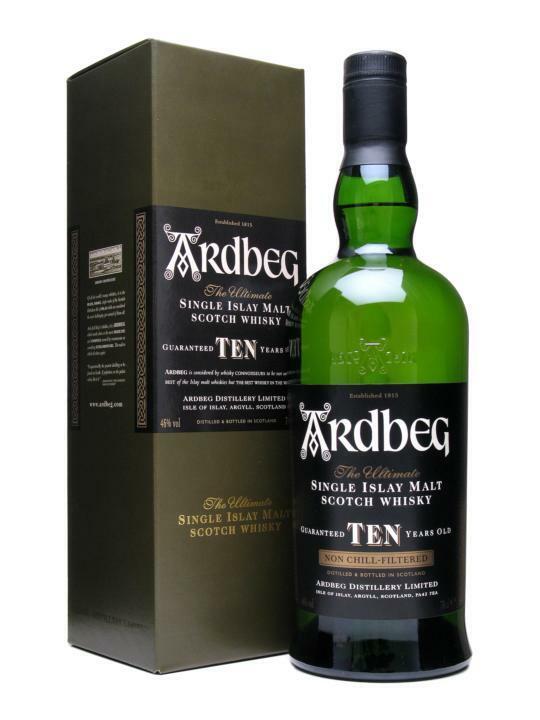 The buttery peat of Ardbeg is a nice change of pace from the smoldering hearth of Laphroaig. I am eager to try some of Ardbeg’s NAS offerings. Any recommendations? One of my top fave “standard offerings” in the whisk(e)y world is Ardbeg’s Uigeadail. It’s sherried, peated and near cask strength – and very reasonably priced (almost always under $75). It’s a gem and a “must have” for the peated whisky fan. Corryvreckan is also outstanding, but usually a bit more pricey, and definitely younger. I also think Caol Ila is outstanding, as is Laphroaig and Lagavulin. I like almost everything from Islay & Campbeltown – except for regular Bunnahabin offerings – those leave me a bit flat, not bad – just not amazing. Thanks for the tips Tim! I had been considering picking up the Uigeadail, I definately will now. I just opened my first bottle of Caol Ila 12 yesterday and was great. I’m already a big Laphroaig fan. I’ve got a review of Lagavulin 16 I’ll be putting up this week. I was very impressed. Thanks for the tip on the Bunnahabin too. I’ll wait before snatching one of those up. The Corryvreckan is one hell of a whisky! It’s really good, but for the money, I think the 10 (also excellent!) is a better value. Even when you factor in the lower ABV. I’m curious to try the upcoming Ardbeg Alligator. Sounds like a wild ride. Me too! Hopefully I’ll be able to wrestle one into my cabinet soon. Had some Alligator at a tasting and have also picked up a bottle… It’s good. Very good. A big whisky with lots of oak, vanilla and sweetness. I had it an Ardbeg vertical tasting, and I’d say it’s a more vanilla-tinged version of Cory. They tasted very much alike at their essences, but Alligator has more wood & vanilla (as you’d expect given the wood treatment), and Cory has a bit more smoke & spice. I like them both quite well. But as I’m much more familiar with Cory, and tend to prefer the “spice” flavors I’d opt for Cory over ‘Gator if I had to choose, but they are both excellent. Alligator just needs to be about $10 cheaper to be a great buy and become a staple. Cory is pretty expensive for what it is, but the taste (mostly) justifies the cost.